Overlooking MacArthur Park Lake, Jesse Thorn is recording tracks for his latest “Bullseye” podcast episode inside a recording booth that he bought off Craigslist for $3,500. The approximately hour-long interview show, which also airs on NPR, features intimate conversations with musicians, artists, comedians, celebrities and creators of all kinds. Thorn’s been making podcasts since 2004 when he was 23 years old, and he’s been talking into a mike since even earlier. 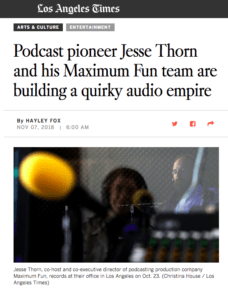 As a sophomore at UC Santa Cruz, Thorn started “The Sound of Young America,” a radio show on KZSC-FM that eventually evolved into “Bullseye With Jesse Thorn” and made way for the full-fledged production company, Maximum Fun, which he oversees today.